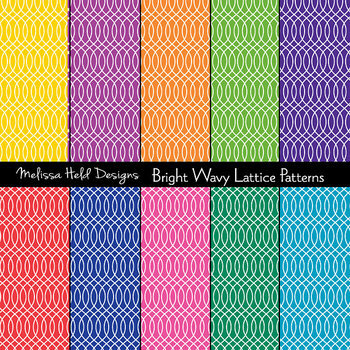 This is a collection of 10 white wavy lattice patterns on bright backgrounds by Melissa Held Designs. You can use these patterns for scrapbook paper, gift wrap, origami, collage, or any other digital and paper design project for home and school. Patterns are 12" x 12". This includes 10 JPGS. All monitors and printers are different, therefore I cannot guarantee colors will appear exactly as they do on your screen. These designs are for personal and limited commercial use and are not to be resold or redistributed in current format. Please contact me with any questions regarding usage and licensing.